Approximately 25,000 house fires every year are attributed to space heaters. User error is the primary cause, although heaters without essential safety features may malfunction and pose a fire risk. Here are five ways that you can prevent a burned space heater from starting a fire in your home. 1. Keep a minimum of three feet between space heaters and combustibles. Combustibles include bedding, curtains, and upholstered furniture. You should also only operate a space heater on a hard, level, non-flammable surface. 2. Don't operate heaters unattended around pets or kids. Children, cats, and dogs don't understand the principles of fire safety. 3. Purchase a space heater with safety features. One of the best ways to prevent a burned space heater is to purchase a model that automatically shuts off when it overheats. Check the model you are considering for a safety certification label, ground fault circuit interrupter plug, and a sturdy cord that is at least six feet long. Make sure the heater has all of the features you need to stay warm while running a very low risk of fire. 4. Turn off or unplug heaters when not in use. This can reduce the risk of a fire starting when you are elsewhere in your home or away from home. 5. Avoid plugging other electronics into the same outlet as a space heater. You should also never use an extension cord, as this equipment heightens the overheating risk. Your heater can only work as designed if it is kept in working condition. You may need to regularly clean the filter on your space heater to prevent it from overheating. In addition to following these steps, you should also test the smoke alarms in your home and replace batteries or damaged units. If a burned space heater does cause a fire, contact SERVPRO of South Livingston at (225) 667-2220. For more information, please visit us at http://www.SERVPROlivingston.com/. A flooded home is one thing. There is an understood protocol in dealing with a flooded home, and it is to stay dry and call emergency restoration services in the South Louisiana area after the damage is done. But, flooded roads offer a different and deceiving problem. 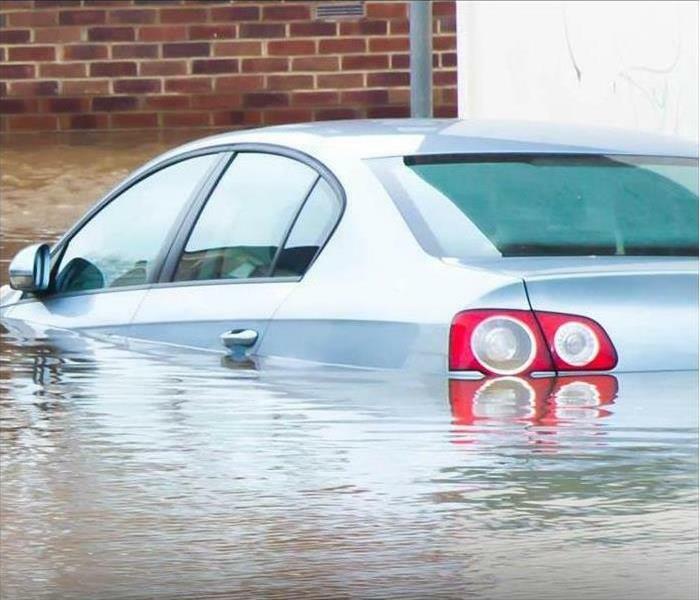 A flooded street that looks intimidating to walk down may not look that scary from the inside of your vehicle, but floodwater should never be underestimated. True, the water level may only be about 12 inches deep, but that level of rushing water is enough to carry a small car, and if the depth increases to 2 feet, then it can carry almost any vehicle. Despite the weight of most vehicles, it is no match to the surge and power of rushing flood water, no matter the depth. The second your car begins to float you have lost all control. Steering, accelerating, and breaking will do nothing to help you maneuver obstacles in the flooded street. A vehicle becomes a projectile with a passenger. As waters rise, it is possible that your floating vehicle will roll and flip upside down, which can make it difficult and dangerous for an escape attempt. It is also important to note that the water does not have to be significantly deep to flip your vehicle. The same 12 inches that can move your car can also flip it. If you are trapped in a vehicle on a flooded street with moving water, then stay inside your car until help arrives. If your vehicle begins to flood, then move to the roof of your car, but do not enter moving water. Flood water is dangerous, and your safety is paramount. How Can FEMA Help Storm Damage Victims Recover From the Aftermath? In addition to helping repair physical damage, the agency also provides assistance for damages that arise as a result of the physical damage. After a flooding or other natural disaster in Livingston, LA, it is not uncommon for individuals to need to relocate and/or take time off work. If an individual is forced to take time off, his or her employer may be forced to let him or her go. FEMA provides unemployment benefits and reemployment services to individuals who are forced to take time off or relocate post disaster. The agency also offers crisis counseling to individuals and whole communities who have suffered great loss as a result of the disaster. It does this by funding and sometimes hosting community-based outreach programs and educational services. Often, the individuals who need disaster assistance are low-income. These individuals generally cannot afford legal services if they need them for their disaster related needs. The federal agency helps these individuals secure legal services when they're needed. In addition to providing the aforementioned types of assistance, FEMA also partners with other government agencies, as well as non-government agencies, to meet the needs of disaster survivors. If the agency cannot meet your unique needs, you can talk with a representative to see if one of its partner agencies can. You can also talk to your local storm damage restoration team regarding types of assistance available. Across the United States, flooding is one of the most commonly widespread weather-related disasters. Whether your home or business is near a coastline, along city streets, in the mountains, near a river or even in the desert, there is always potential for flood damage. Though you may have never experienced a flood in the past, there’s no level of security to assure that you won't in the future. In fact, 20% of all claims paid by the National Flood Insurance Program (NFIP) were for policies in low-risk communities. Stay away from floodwaters as much as possible. If you approach a flowing stream where water is above your ankles, stop, turn around, and go another way. Six inches of swiftly moving water can sweep you off of your feet. If you approach a flooded road while driving, turn around and go another way. If you are caught on a flooded road and water are rising rapidly around you, get out of the car quickly and move to higher ground. Most cars can be swept away by less than two feet of moving water. Ensure that your building or suite is visibly lettered and numbered so that emergency responders can easily find your location in a timely manner. Numbers should contrast with the background used, such as black/white, while the numerals should be no less than six inches in height. Fire extinguishers should be no more than 75 feet from work areas for easy access, and they should be mounted in a highly visible spot that is easy to get to. Make sure your extinguishers are serviced at least once a year by a licensed fire extinguisher company. Exits need to be clearly marked with EXIT signage and should be illuminated at all times, with a battery backup for power outages. Exits should also be clear of any obstructions so that people can get out safely and quickly. Emergency lighting should be kept in working order, and the area around the building outside clear of debris and plant material, reducing the fire risk outdoors as well. Stored materials need to be stacked at least two feet below the ceiling and be orderly. For buildings with an automatic sprinkler system, 18 inches of clearance is required, allowing smoke to collect up high, which gives people adequate time to exit and the sprinklers a clear area for their spray pattern. Electrical outlets should have no more than one item per outlet plugged in, which may include a power strip with a circuit breaker. All electrical cords should be kept in good repair and replaced when needed. Trash receptacles need to be kept at least five feet away from combustible roofs, windows, and door openings and not stored in the path of exits. Have your sprinkler system tested and serviced every 12 months or less by a licensed fire sprinkler company. This practice should also be used for your fire alarm system. If your business involves cooking foods, make sure your stove hood has been cleaned at least once every year to prevent excessive grease buildup. Ceiling exhaust fans and bathroom heater/light/fan combinations can also be a risk due to a buildup of dust and grease, resulting in increased operating temperatures. Make sure your local fire department has valid contact information on file for your commercial property. For more information call SERVPRO of South Livingston at (225) 667-2220. You cannot clean up mold on your own. The EPA’s recommendation to clean up a moldy area of up to 9 square feet is to wipe it with a cloth dampened with a diluted bleach solution. The EPA and California Department of Public Health always recommend mold consultants. They do not. In fact, minor mold situations, they say, can be handled by the resident or with janitorial staff. Mold consultants are licensed. Mold inspectors or consultants are not licensed by the government, but instead hold credentials and memberships in trade organizations. Mold cannot be caused by the resident. Mold accumulation can often be caused or worsened by a failing to properly ventilate a residence. Mold can build up in stuffy bathrooms or any area where the environment is humid, warm and poorly ventilated. Insurance never covers mold. Partially true: Property insurance policies do not normally cover mold, fungus or dry rot. If a water damage incident occurs, and the damage is not discovered and ventilated soon, mold can result (and dry rot). The property insurance will normally refuse to cover the cost of mold remediation, but will still typically cover the rest of the repairs. However, if the property owner is sued because of water damage including mold, the liability part of the policy ordinarily will defend the claim. Let the emergency contractor do everything. Because of the panic associated with mold, the normal reaction is to call emergency services contractors. Such contractors are more expensive, because of their readiness to respond almost immediately at any hour. Stopping water leakage and drying the space might require an emergency contractor. However, sometimes a plumber might be enough. Keep demolishing walls until you find no mold. Panicked residents often ask a landlord or HOA to open walls to look for mold. However, this is almost always a waste of money. Allow demolition only of what is immediately necessary, and then seek bids for the non-emergency work. Mold damage situations must cost at least $10,000 per occurrence. The cost of repairing water damage skyrockets due to unnecessary tests, delays in responding to the leakage (the most common cause of mold buildup), excessive demolition and using emergency contractors for everything, and foregoing competitive bids for repairs. Be more deliberate, and save money. Lightning causes around 31 deaths in the U.S. annually (based on statistics from 2006-2016). Nationally, lightning ranks second only to flash floods in weather-related deaths. Lightning is the most frequent important weather threat to personal safety during the thunderstorm season, and it is also the MOST UNDERRATED weather hazard. Unfortunately, Louisiana has observed several lightning fatalities and injuries. Why? The main reason is that people stay outside too long as thunderstorms approach or form nearby. During the early part of the thunderstorm season, for example May and June, "dry" thunderstorms are quite common. With these types of thunderstorms, little or no precipitation reaches the ground and, as a result, people are less likely to seek shelter. While most lightning casualties occur at the beginning of an approaching storm, a significant number of lightning deaths occur after the thunderstorm has passed. If thunder is heard, then the storm is close enough for a lightning strike. DO NOT wait for the rain to start before seeking shelter, and do not leave shelter just because the rain has ended. The air near a lightning strike is heated to 50,000 ° F. That is hotter than the surface of the sun! The average flash could light a 100-watt light bulb for more than 3 months. Lightning occurs with all thunderstorms. It's not raining, is there still danger from being struck by lightning? YES! Lightning often strikes outside of the heavy rain area and may occur as far as 10 miles away from any rainfall. Will the rubber soles of my shoes or tires on my car protect me from being struck? NO! However, the steel frame of a hard-topped car provides increased protection if you are not touching metal. Although you may be injured if lightning strikes your car, you are much safer inside the car than outside.To roughly estimate the distance in miles between you and the lightning flash, count the seconds between the lightning and the thunder and divide by 5.When skies darken or thunderstorms are forecast look and listen for increasing wind, flashes of lightning, sound of thunder, and static on your am radio. While no place is safe from lightning, some places are much safer than others. Get inside a house, large shelter or an all-metal vehicle (not a convertible). Do not use a corded telephone during a thunderstorm. Only use cordless or wireless phones instead. Remain clear of tall, isolated trees and telephone poles. Stay away from wire fences, clotheslines or metal pipes and rails. If you are caught outside, away from shelter, you need to get to a place of safety as quickly as possible. Wait 30 minutes after you hear the last rumble of thunder before going outside. We hope you never have to experience damage from lightning strike but if you ever find yourself in that situation call the experts at SERVPRO of South Livingston (225) 667-2220. Dryers come equipped with a lint trap to catch and collect the lint and tiny threads that come off of clothing when residents do their laundry. Over time, larger items, such as broken zippers, can wear tiny holes into the trap. These holes can permit lint to pass through the trap and into the duct. When clogs develop in the interior of the duct, heat can build up and result in a fire. If you live in or near a flood zone and plan on being a first responder, it is important to prepare for a disaster situation ahead of time. Keep these three flood response guidelines in mind. The Center for Disease Control recommends that disaster responders receive a tetanus booster if they have not been vaccinated against this disease in the last 10 years. Either the tetanus/diphtheria or tetanus/diphtheria/pertussis vaccination can be used. The CDC also recommends the Hepatitis B vaccine for responders who plan to provide medical care. First responders should take measures to protect their skin from contaminated flood water. Wear electrically insulated watertight boots with a steel shank, toe, and insole. Hip waders can also limit exposure to standing water. A first responder should also wear thick, waterproof work gloves and safety goggles or glasses. Long pants or coveralls, a long-sleeved shirt, and a protective head covering are also suitable for flood response work. If responders expect to enter locations that may be experiencing mold growth, a respirator may also be necessary. Flood water poses a threat even if it does not seem very deep. If a person slips and falls in just six inches of water moving at six miles per hour, he or she may not be able to regain footing. Vehicles may float in 12 inches of water moving at the same speed. Exercise caution and only wade through flood water that is no more than four inches deep, is not moving, and has a visible hard surface underneath. These flood safety pointers can help to keep a first responder to a flood emergency safe. If your residence becomes flooded, document the damage and schedule a consultation with a flood damage mitigation and restoration company located in Denham Springs, LA. 1/2/2019 - How Can FEMA Help Storm Damage Victims Recover From the Aftermath?